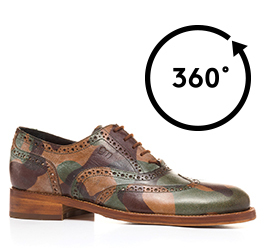 The brand new elevator derby Rue de Rennes feature a unique upper in a special camouflage leather, handmade in Italy. The insole and outsole are in genuine Italian leather, assembled by hand with anti-slip rubber. The height insole can be chosen between 2.4, 2.7 and 3.1 inches. With their ultra-comfortable fit and the extreme quality of the leather used, they are perfect for casual and stylish nights.